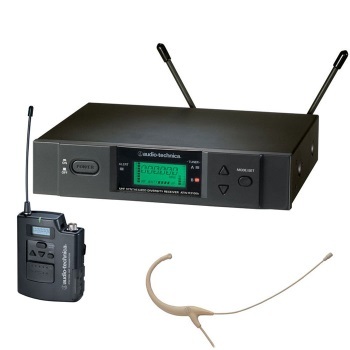 The Audio Technica 3000 Series wireless systems provide reliable, professional UHF technology for the most demanding of applications. The ATW-R310 Receiver features frequency adjustable UHF reception, allowing access of up to 200 user selectable channels. Diversity reception allows 2 built-in, independent receivers to relay on a single frequency for the strongest possible reception. The rear panel reveals both unbalanced 1/4" phone and balanced XLR outputs. A comprehensive back-lit LCD display reveals channel and frequency settings, signal status and transmitter battery status. The receiver also features a ground lift switch, convenient in settings where bad power feeds result in ground hum and noise on the output stage. The ATW-T310 Body-Pack Transmitter features Audio-Technica's unique UniPak input connector. The input conveniently accepts both line and microphone level signals (adjustable) allowing instrument signals as well as microphone signals. An assortment of compatible microphones and instrument cables are available from Audio-Technica. The lightweight transmitter operates on 2-AA Alkaline batteries for up to 6 hours (High) and 8 hours (Low). The inconspicuous AT892CW headworn microphone measures just 2.5mm in diameter and features an omnidirectional polar pattern. It's size, polar pattern and flesh tone finish make it well suited for presentations, video shoots and more. Frequency Agile The system operates on UHF frequencies allowing greater channel selectability and range. The transmitter and receiver feature 200 user selectable channels. The ATW-R310 receiver features dual internal receivers. The receivers relay between each-other, vying for the strongest reception while minimizing noise and signal drop-out. Audio-Technica's UniPak transmitter is a body-pack with an input connection designed for low and high impedance signal. This makes the transmitter versatile enough to handle microphone and line level signals. .